Faculty, staff, and students at Seaver College join forces to create a memorable, identity-enhancing Sophomore Experience for students who stay in Malibu. Seheri Swint was nervous as she and a large group of Pepperdine sophomores approached the landmark Golden Gate Bridge in San Francisco, California, this past February. She had recently come across some grim statistics about the rate at which people jump from certain points along the bridge. The idea troubled her and she confided her anxiety to accompanying faculty member Ray Carr, assistant professor of religion. Other students joined the prayer, forming a circle of compassion for those who go to the bridge armed with lost hopes. 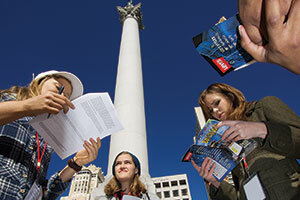 The experience united them all with a faith-forming, community-strengthening, life-affirming memory—which is exactly what the sophomore trip to San Francisco was designed to do. The concept of “the sophomore slump” is familiar to many: the notion that after the luster and excitement of a year of firsts, the second year of college can be a more challenging experience for students as they seek to find or establish their identities. With a strong international programs department at Pepperdine—ranked number two in the nation for “Number of Students Who Study Abroad for a Full Academic Year” by the Institute of International Education in 2011—it might seem like that shouldn’t be an issue, as approximately half of all Seaver College sophomores travel to one of the University’s seven programs worldwide. But that leaves another half in Malibu for the year. In the last two years, Pepperdine has taken definitive steps to enhance the sophomore year for students in Malibu and provide the same enriching overall experience—in faith, in friendships, in academics, in overcoming challenges—that students who travel abroad report experiencing. The Sophomore Experience/Second-Year Pilot Project provides living arrangements, social engagements, and trips off campus that parallel the “best of” the international experience for the students who remain. The need for an organized Sophomore experience came to light a few years ago thanks to the research of professors Don Thompson and Cindy Miller-Perrin. The academic partners have studied faith and vocation for 10 years, researching how students’ sense of vocation and calling evolves over time, from freshman to senior, across the University. They are currently on their third cohort of students. “What we’ve found is that sophomores are at a greater risk of experiencing an identity crisis,” notes Miller-Perrin, Blanche E. Seaver Chair of Social Science and professor of psychology. Having noticed these trends among sophomores, the pair added a sophomore-exclusive survey to their research. They weren’t initially comparing second-year students who stay in Malibu with those who participate in international programs, but the survey results from sophomores yielded such dramatic responses that one thing became very clear: students return from abroad positively changed. Miller-Perrin and Thompson took their findings to the University administration, and partnered with Student Affairs to develop the program of initiatives for sophomores—the first of its kind dedicated to the well-being and growth of an entire class of students. After securing funding and getting the curriculum in place, the pilot project debuted in Fall 2011. The strategic initiative brings together sophomores in a number of ways that include living (themed housing), academics (speaker series), faith (worship), leadership (student-led initiatives), travel (trips to San Francisco and Catalina Island), and social (mixers and “bucket list” experiences around Los Angeles, such as trips to watch baseball games at Dodger Stadium). Swint selected to live in “House Lead” during her sophomore year, one of six themed housing options for students to select; the other five are Honors, Global Justice, Pepperdine Arts District, Adventure, and Confidence. In her junior year just past, Swint stayed with the house as a resident advisor (RA). As a united sophomore class, the group travels to Catalina Island just off the coast of Southern California every fall, followed by a weekend jaunt to San Francisco in the spring. The students—87 on the most recent trip to San Francisco—are encouraged to make new friends and get to know and trust the faculty and staff members in a way that connects them as part of a cohesive, Pepperdine community. Timothy Lucas, assistant professor of mathematics, witnessed Swint and Carr in prayer on the Golden Gate Bridge, with a small group of three or four students, and took note of it as a perfect example of what they are trying to achieve with the Second- Year Pilot Project. The project leaders employ a different theme each year to enhance the San Francisco weekend experience, and the city was chosen for both its relative distance and proximity to Malibu, as well as its international appeal. “We wanted to create a unique experience that mirrors the abroad experience,” explains Kari Enge, director of intercultural affairs. “Last year we centered it around Chinese New Year; we spent a lot of time in Chinatown, immersing ourselves in the culture there. The group explored the theme in a problem-solving scavenger hunt that took them all over the city in groups of 15 random students. Stephen Davis’ group noticed that there was an international sophomore from China who did not appear to belong to a group, so they invited her and, coincidentally, ended up eating lunch in San Francisco’s famous Chinatown. Later that Saturday, the sophomores listened to a panel of four San Francisco-based Pepperdine alumni, who each represented the theme of global citizenship/local engagement with their respective lifestyles and careers. “The panelists showed our students how their lives engage the broader world in very different ways,” says Robert Williams, associate professor of political science, pointing out that sophomores are often still weighing what majors to pick for their own careers and need to hear the opportunities they have for making a difference with their lives. That is the message that sophomore Matthew Cranmer, a computer science major, took to the University Board this spring as a voice for second-year students who are thriving on these programs of development, enrichment, and community. “Because of my struggles and experiences, I’ve been able to share how the programs are a success,” he says. Swint will continue as an RA of House Lead this fall, and has big hopes for the Second-Year Pilot Project, including incorporating the theme into more of the minute plans and creating even more programs. Even as an incoming senior, she remains committed to making Sophomore Experience as engaging and fruitful for this year’s sophomores as she can.